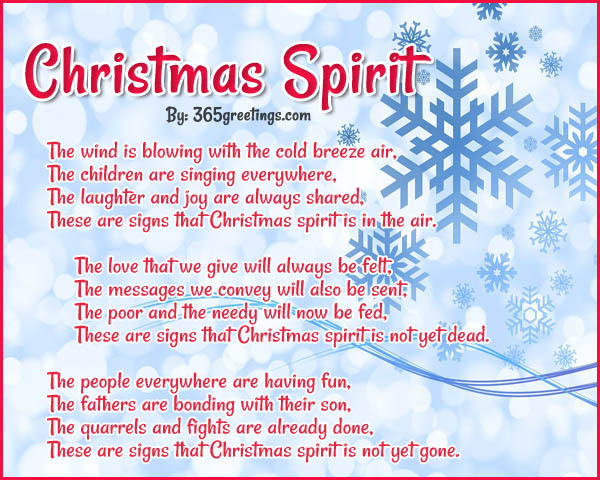 Christmas Poems: Christmas is celebrated every 25th of December. The happiness and joy that you can feel during this season cannot be explained. It is the perfect time to be with your family, friends, and love ones. Everywhere you can hear bells ringing, Christmas songs playing, and the children singing. As you look outside your window, you could see the people playing in the snow and having a great time with everybody. One of the most memorable childhood experiences that children usually have happens during this season. 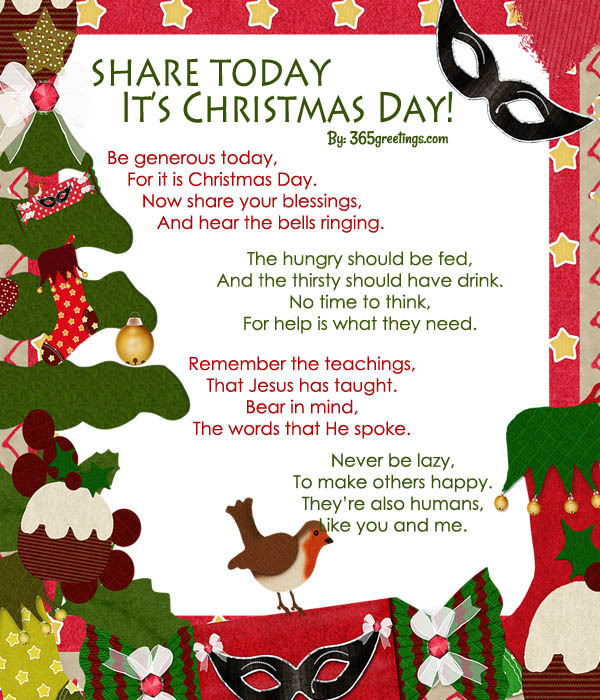 The essence of Christmas is really to give love and share the blessings that you have. During this season, children are the ones that are most excited because this is the time that they would receive gifts and have new toys. They also love caroling from house to house and greeting everyone a Merry Christmas. Never forget to thank God for everything that you have. 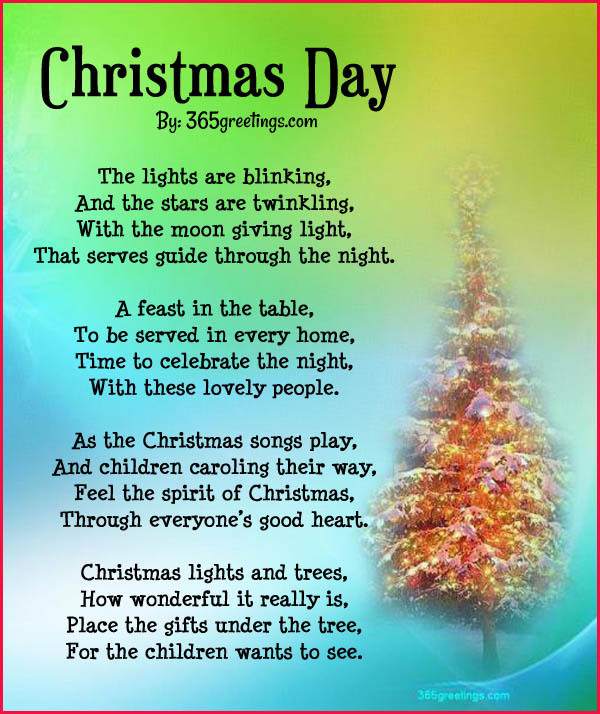 As you send a Christmas greeting, it would be great to have a poem that would inspire them not only this Christmas but throughout their lives. This would show how sincere you are in sharing your love and care for them. MERRY CHRISTMAS! 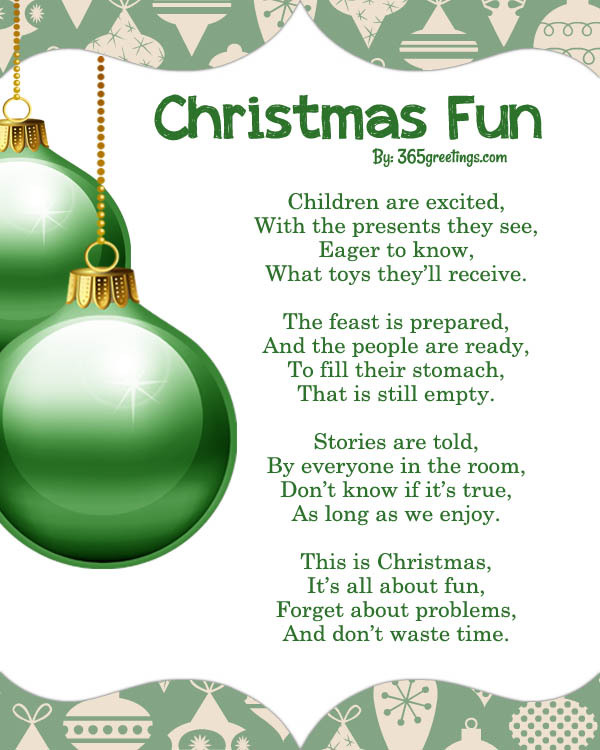 It’s really nice to read some fun poems about Christmas as the holiday approaches. 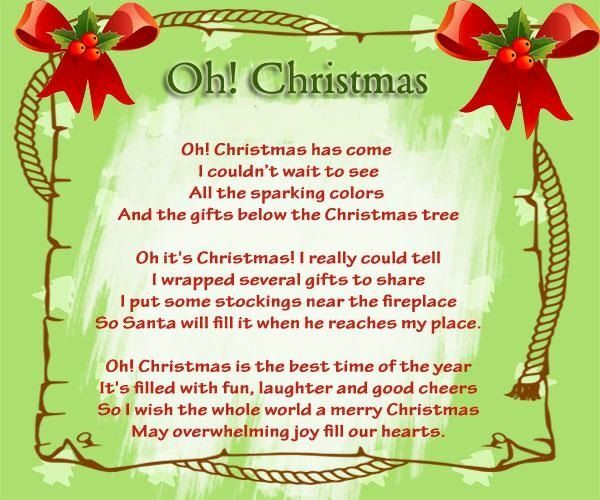 As a kid, I used to write some short Christmas poems in a Christmas card and send them out to my friends in school. Although some of those are very short and simple, they like idea of receiving something like that. 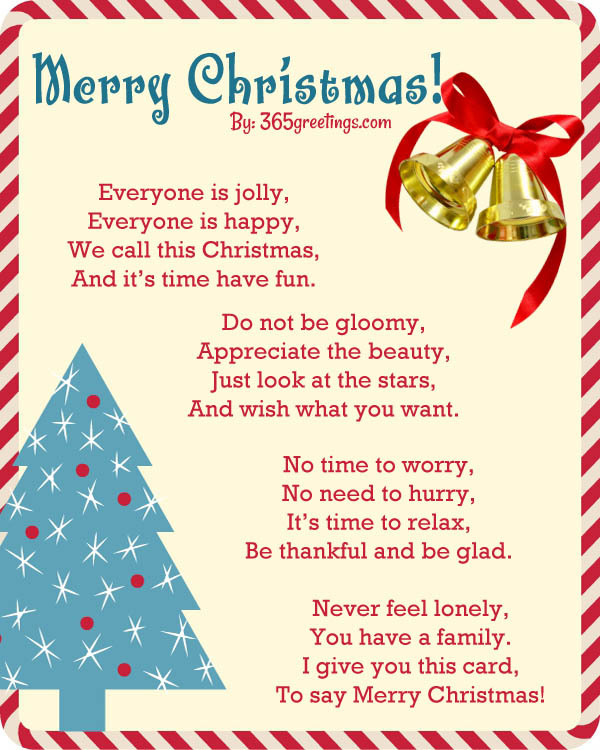 If you wish to send out cards this Christmas to your friends and can’t find the words to greet them, you may choose from these short yet good Christmas poems. Let us spread the love to everyone around. And everywhere you will hear a laughing sound. Always remember your nephews and niece. For it is always better to give than to receive. So there is no reason for you to be with no one. And you will be blessed by the Almighty One. How beautiful the world we live in is. And you will definitely experience happiness and peace. 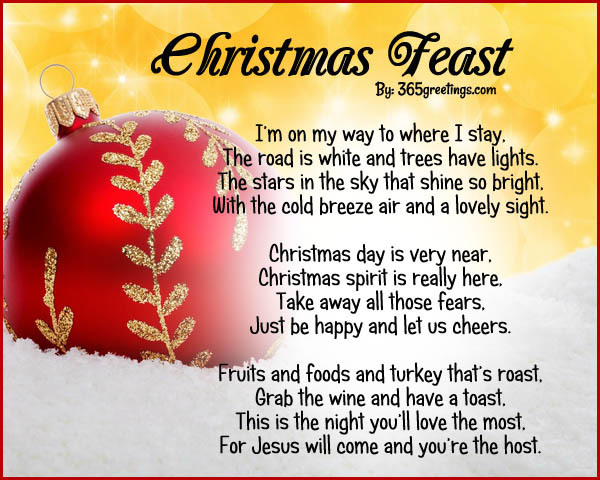 If you are looking for Christmas poems that reflect the faith, belief of Christians, you’re at the right place. 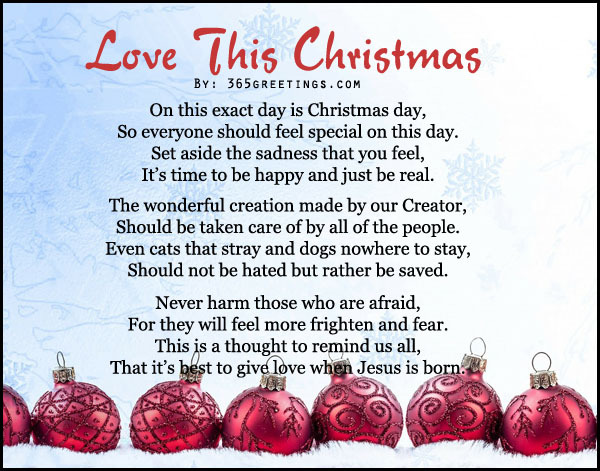 Whether you’re gonna use it for a card or simply want to share to your friends for inspiration, these samples of Christian and inspirational Christmas poems may be of help for you. Enjoy! These are signs that Christmas spirit is in the air. These are signs that Christmas spirit is not yet dead. These are signs that Christmas spirit is not yet gone. This is a phrase that we’ve all been hearing. For Christmas is already here with me and you. Honor and praise for Jesus is coming. Be thankful to God of what you are receiving. And share it to others who have no food. It is time to think of what we’ve been doing. Is there a good place where the world is going? And focus on deeds that would only do good. Remember that all lives are worth living. There’s always a purpose of what you are making. Never feel blue for God is always with you. 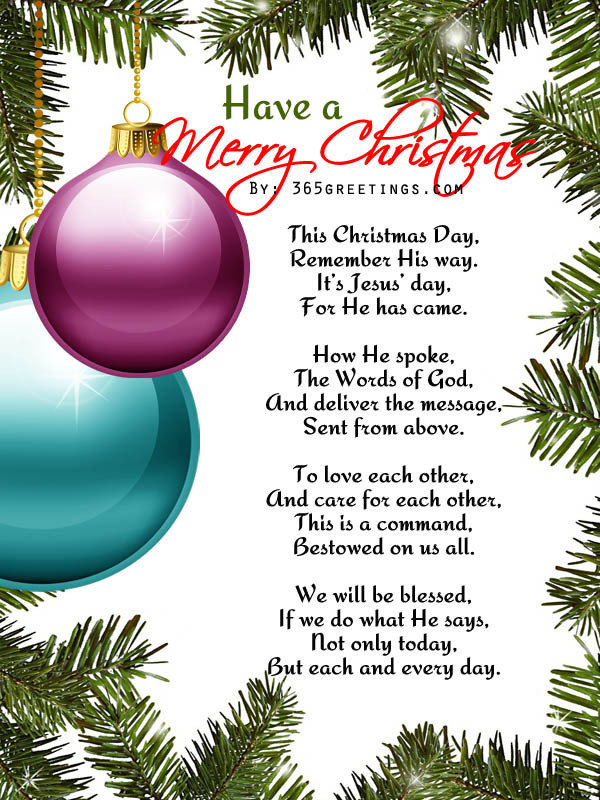 Do you want to greet your friends, family and relatives this Christmas with the use poems? Well, you’ve got the perfect choice. 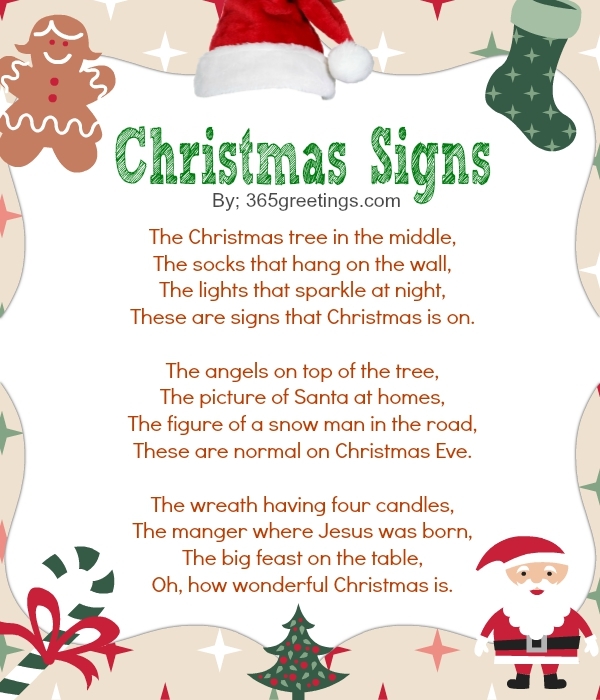 Surely, they’ll love these simple and short Christmas poems that can be used as Christmas card wordings, etc. And it’s time have fun. And wish what you want. Be thankful and be glad. If you’re searching for poems that you and your kids would like to enjoy this holiday season, this section is for you. 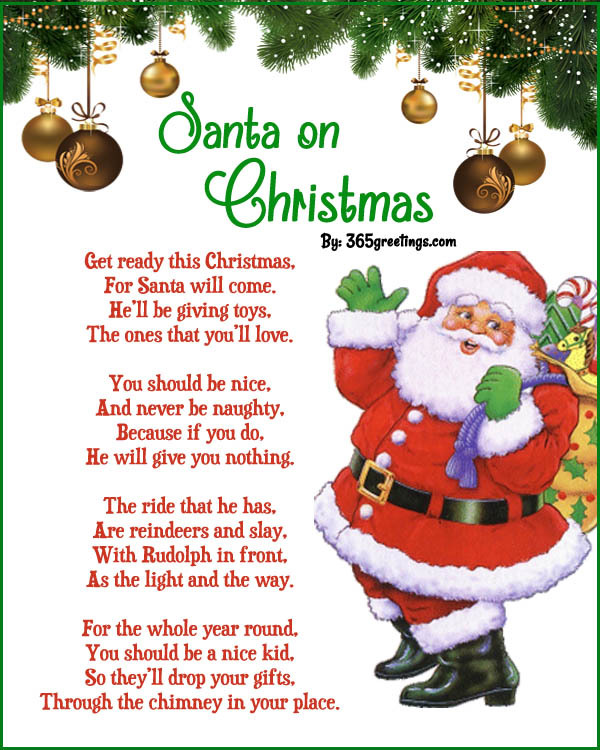 Here are some short and cute Christmas poems for Children written suitable for kids and young at heart. The ones that you’ll love. He will give you nothing. As the light and the way. Through the chimney in your place. That serves guide through the night. For the children wants to see. 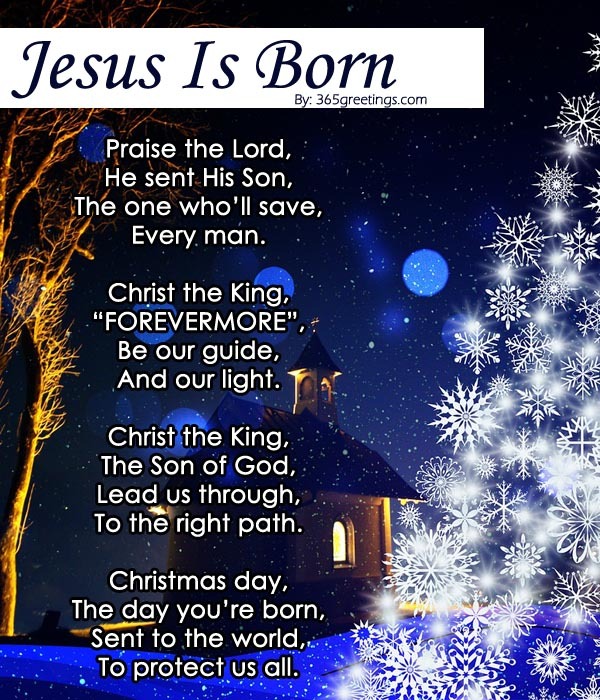 Christmas Day is known to be the day when the Christ was born. 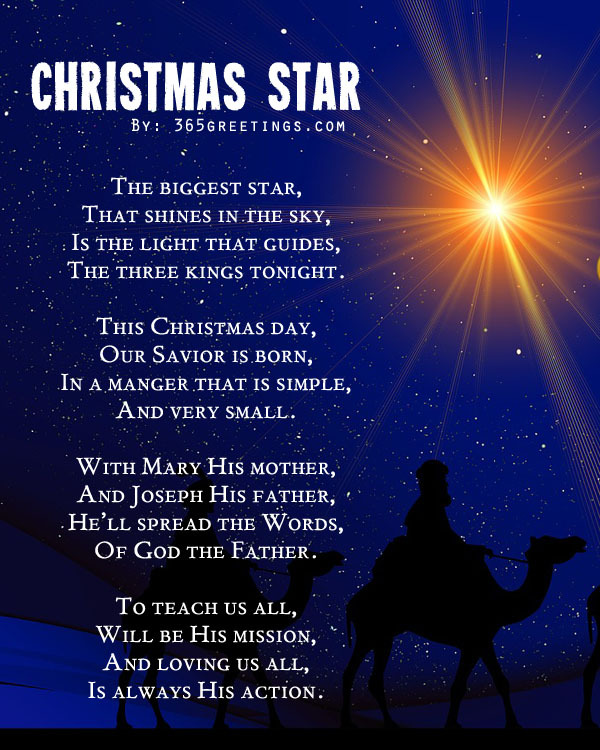 Don’t forget the essence of celebrating Christmas season by reading these religious Christmas poems focusing on Jesus. The road is white and trees have lights. With the cold breeze air and a lovely sight. Just be happy and let us cheers. For Jesus will come and you’re the host. 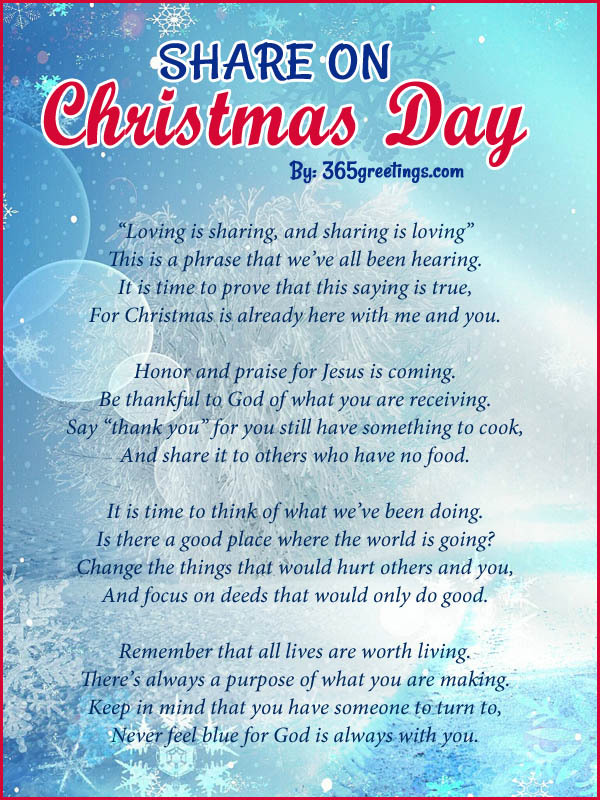 Inspire and encourage this Christmas through these inspirational Christmas poems. Each line and stanza would surely give inspiration to everyone. Happy Holidays! And hear the bells ringing. And the thirsty should have drink. For help is what they need. The words that He spoke. But each and every day. So everyone should feel special on this day. It’s time to be happy and just be real. Should be taken care of by all of the people. Should not be hated but rather be saved. For they will feel more frighten and fear. That it’s best to give love when Jesus is born. 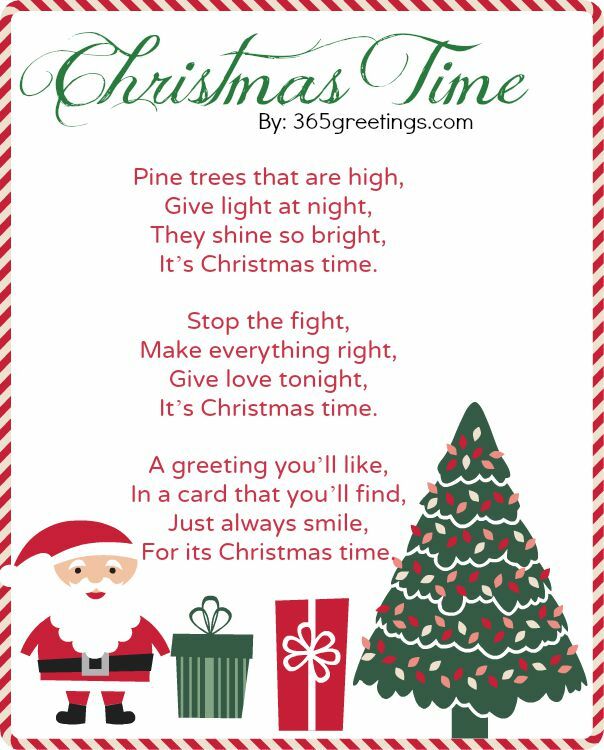 If you don’t know what to write in a Christmas card, you may want to consider using short Christmas poems. 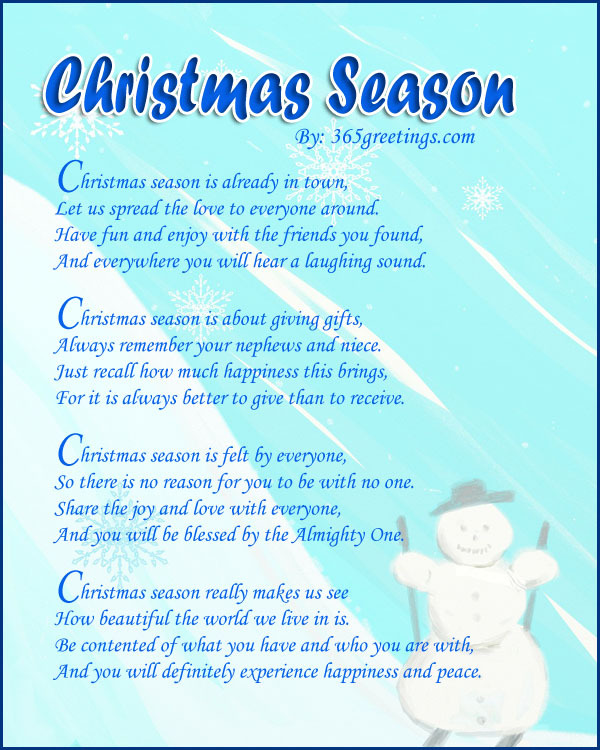 You may choose some funny Christmas poems and attach to your Christmas greetings. Of course, don’t forget to include your own Christmas messages on the cards and your recipient would definitely love it~! As long as we enjoy. These are signs that Christmas is on. These are normal on Christmas Eve. Oh, how wonderful Christmas is.